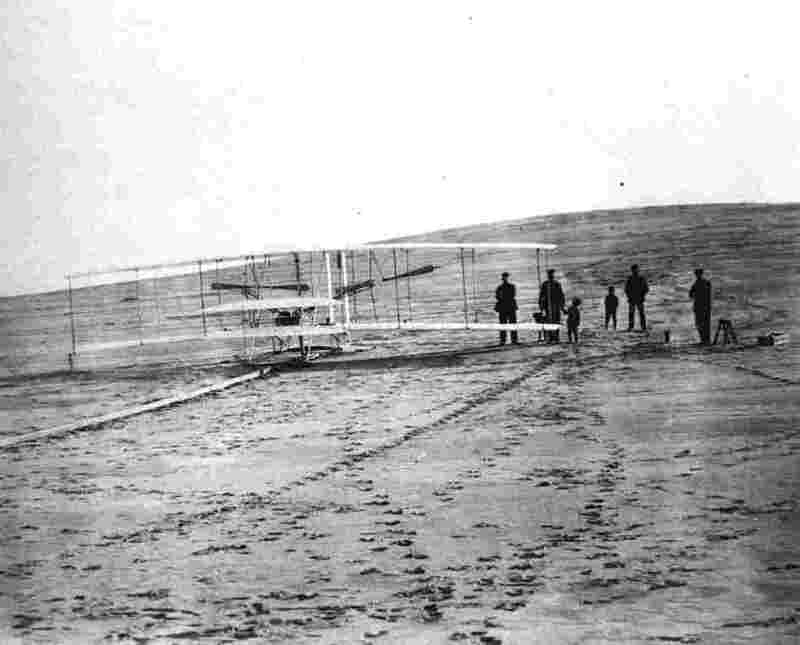 he Wrights arrived in Kitty Hawk on September 25, 1903 and began to build a new, larger hanger for the Flyer. They also rigged their 1902 glider so it was closer in configuration to the Flyer and made practice glides whenever the winds were up. Meanwhile, they seemed to have a little competition. Not the French that Chanute had fired up, but someone on their own side of the Atlantic. Samuel Pierpont Langley, Secretary of the Smithsonian Institution, had been developing a man-carrying aerodrome since 1896, and on October 7, 1903, it was ready for its first flight. Langley planned to launch the machine by catapulting it from a houseboat, much the same way he launched his unmanned aerodromes. With Charles Manly, the co-designer of the "Great Aerodrome" at the controls, Langley gave the signal to release the machine. 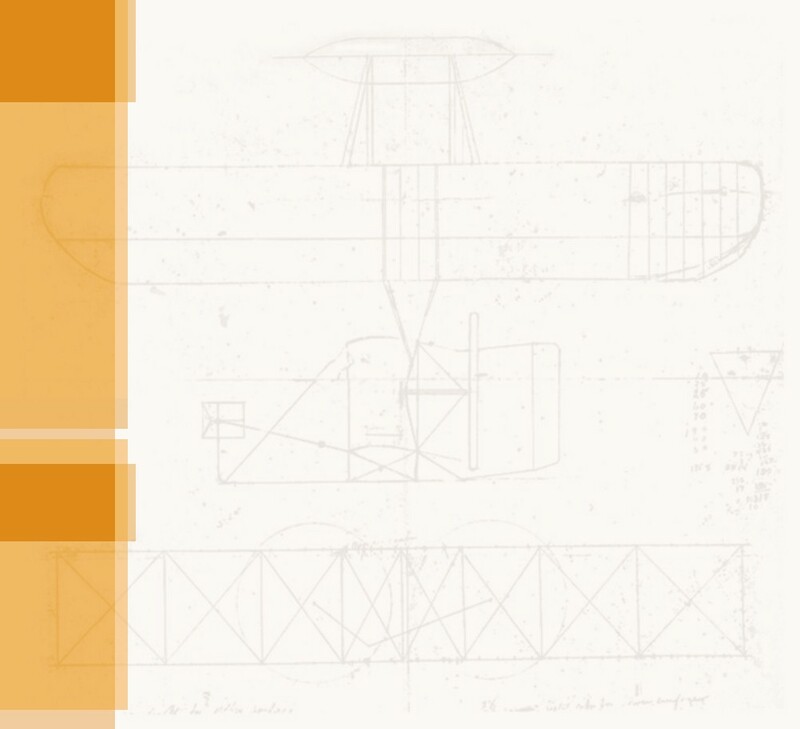 The catapult hurled the machine forward, the wings buckled, and the Great Aerodrome sank into the Potomac River. Charles Manly, fortunately, did not. George Spratt visited the Wright at their camp in late October, and found them behind schedule and beset with problems. They finished assembling the Wright Flyer in early November, only to have the propeller shafts crack when they ran it up for the first time. Spratt volunteered to take the shafts back to Dayton, where Charlie Taylor rebuilt them and shipped them back to Kitty Hawk. Octave Chanute arrived at camp a day after the disappointing run up, bringing news the Langley would attempt another flight before long. To top it off, the weather turned cold a rainy. There was no flying, and Chanute left after a few days. The Wrights received the new propeller shafts from Dayton on November 20, but found the sprockets would not stay on the shafts. No matter how they tightened the nuts, the sprockets worked themselves loose in minutes. "But the darkest hour comes just before the dawn," wrote Orville. "The next morning, thanks to Arnstein's hard cement, which will fix anything from a stop watch to a threshing machine, we stuck the sprockets so tight I doubt whether they will ever come loose again." Unfortunately, this was only a momentary triumph. After several run-ups, the Wrights discovered another crack in one of the propeller shafts. Orville took the shafts himself, leaving for Dayton on November 30. 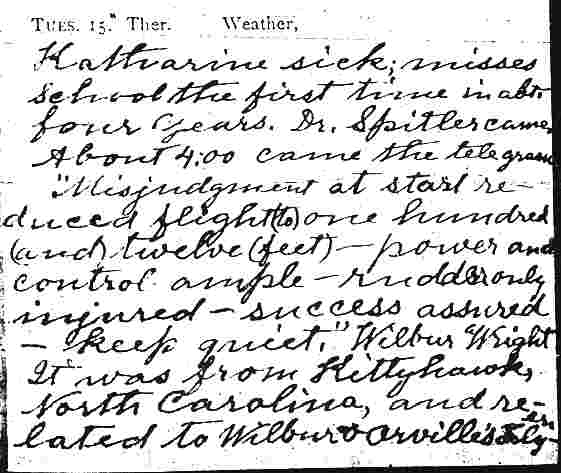 Back home, he made two new shafts of rock-hard spring steel and was on his way back to Kitty Hawk by December 9. He brought with him news of Langley's second attempt to fly the Great Aerodrome. It had gone not so well as the first. Engine howling, it leapt from the catapult and immediately broke in two. Manly became entangled in the wreckage and had nearly drowned. Langley was being ripped to shreds in the newspapers. By December 12, the new shafts were in place and the Flyer was working perfectly. But the wind was too light to attempt a flight. (The Flyer needed a good headwind to take off, otherwise it would not reach flying speed before it passed the end of a 60-foot wooden rail that the machine would roll along on its take-off run.) December 13 was breezy and perfect for flying, but it was Sunday and the brothers had promised their father they would not break the Sabbath by flying on Sunday. The winds died again on December 14, but the brothers were getting anxious and decided to chance a flight. With the help of the Kitty Hawk Life Saving Crew, they hauled the Flyer out of it's hangar, laid out the wooden rail, and pointed the airplane into the wind. "Before I myself was ready, Will started the machine. I grabbed the upright the best I could and off we went. By the time we had reached the last quarter of the third rail (about 35 or 40 feet) the speed was so great I could stay with it no longer. I snapped the watch as the machine passed the end of the track. (It had raised from the track six or eight feet from the end.) The machine turned up in front and raised to a height of about 15 feet from the ground at a point somewhere in the neighborhood of 60 feet from the end of the track. After losing most of it's headway, it gradually to ground...The left wing was lower than the right so that in landing it struck first. The machine swing around and scraped the front skids so deep in the sand that one was broken, and twisted around until the man strut and brace were also broken, beside the rear spar to the lower surface of the front rudder. Will forgot to shut off the engine for some time..."
What had occurred was that Wilbur, unfamiliar with the controls, had climbed too quickly after leaving the ground. The Flyer slowed, stalled, and sank back into the sand. Nonetheless, it had left the ground under its own steam. It was clear to both Wilbur and Orville that the machine would fly once it had been repaired. They began putting it back together immediately and sent a telegram to their father, "MISJUDGMENT AT START REDUCED FLIGHT...SUCCESS ASSURED KEEP QUIET." Click on a photo to enlarge it. Practicing in the reconfigured 1902 glider. The camp is off in the distance. 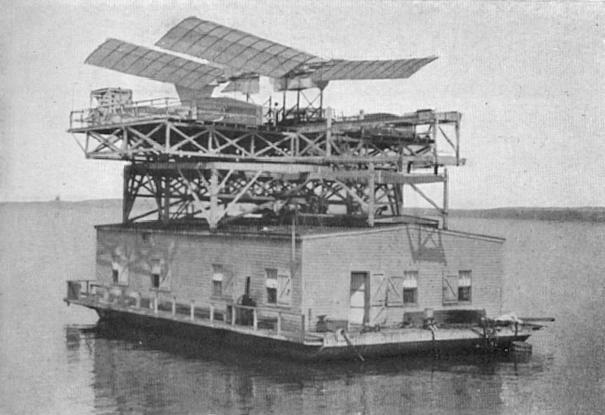 Langley's Great Aerodrome perched atop its houseboat on the Potomac River in 1903. 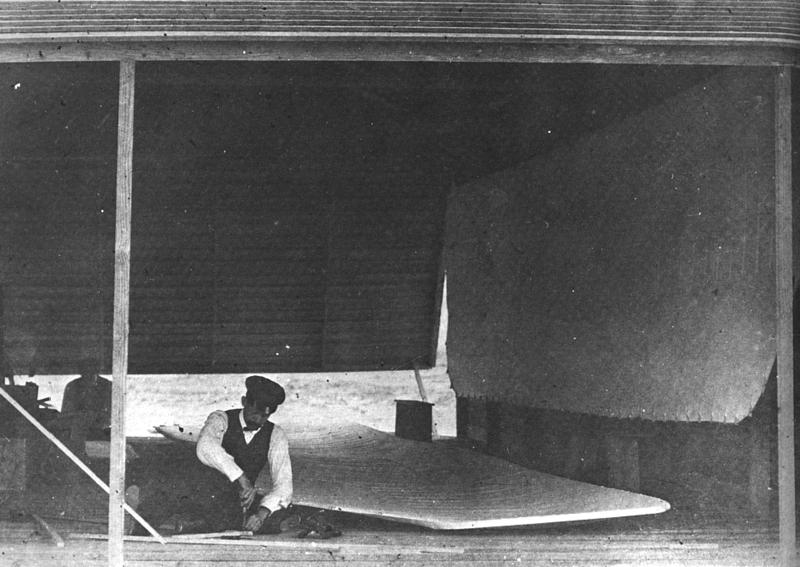 Orville putting together a wing of the 1903 Flyer in the newly constructed hangar. Side view of the Flyer. Langley's Great Aerodrome breaks apart on launch. 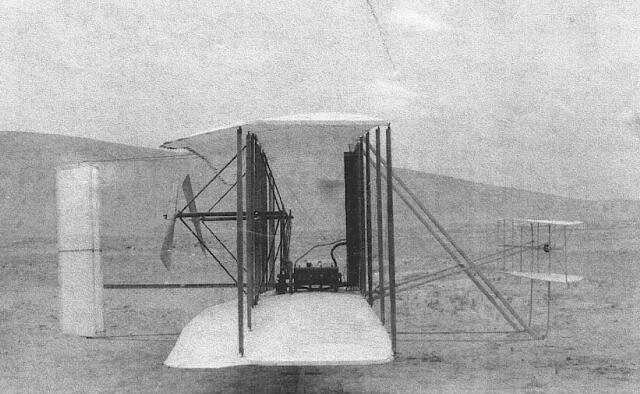 Readying the Flyer for flight on December 14, 1903. Wilbur still clutches the controls after the first attempt to fly on December 14. Bishop Milton Wright's entry in his diary for December 15, 1903. He mentions Wilbur's telegram.